We are the high rockies' local, family-owned and operated, plant-based, wood fire kitchen with a casual and cozy vintage farm decor dining room, serving gourmet New York City-inspired specialty pizzas, healthy salads and desserts, made from mostly fresh, organic, non-gmo, local, seasonal, and house-made ingredients. We believe in offering a healthier and more sustainable approach to dining for all who seek incredibly delicious food, wine & beer; great music, a cozy, family-friendly atmosphere, at reasonable prices for both locals and visitors, while serving from a shared intention...that all beings be happy and free. From the kitchen of New York City-trained vegan chef and business owner of almost 30 years in the making, comes made-from-scratch, wood-fired pizza using house-made cashew cheese, plant-based meats, and fresh veggies. Infamous for his ability to seduce the most skeptic of the skeptics, when it comes to vegan fare, Jason Goldstein keeps ingredients simple and flavors beyond enticing. Committed to offering a healthier and more sustainable approach to dining for all who seek incredibly delicious food, wine & beer, we work with local produce markets, wineries, and breweries to ensure the highest-quality ingredients for our kitchen. We are proud to serve organic, non-gmo, local, seasonal, and house-made plates and drinks. We continue to look for ways to better serve our community. "After traveling around the country for 14 months with our 4 and 2 year old girls, trying to figure out where to land after leaving New York City, we landed in Breckenridge. We thought what a great place to raise our little ones, and start our restaurant. 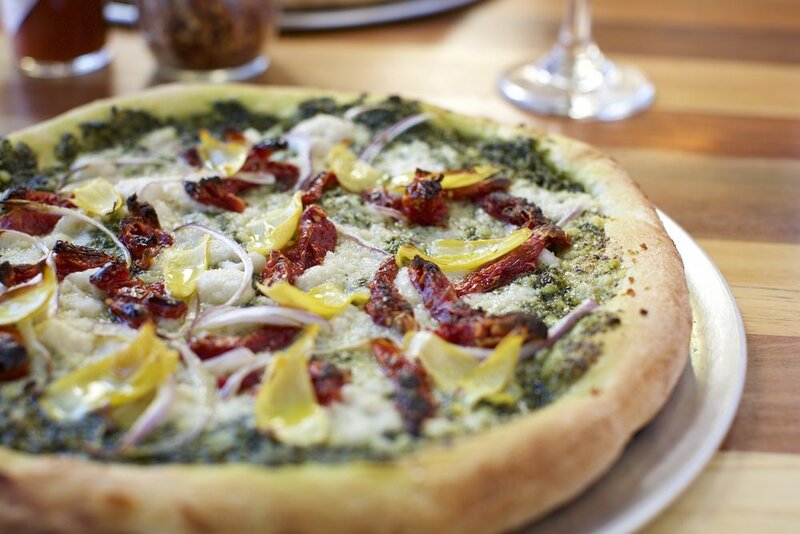 We felt that Breck had everything except a vegan spot, and this little wood-fired pizza spot was for sale, so my wife and I looked at each other and said "vegan pizza: can we pull this off?" After a trying couple of months through renovation, menu creation, and hiring a staff, we are celebrating our one year anniversary for Piante, and we hear thats a pretty big deal in the restaurant game." WE, AT PIANTE PIZZERIA, COME TOGETHER IN COMMUNITY TO CELEBRATE FOOD AND DRINK OF THE HIGHEST QUALITY, WELCOMING FRIENDS AND FAMILY TO OUR DINING ROOM. MAY ALL BEINGS BE HAPPY AND FREE. Please note any nut allergies as many of our dishes include nuts. Many items can be made nut or gluten free upon request. 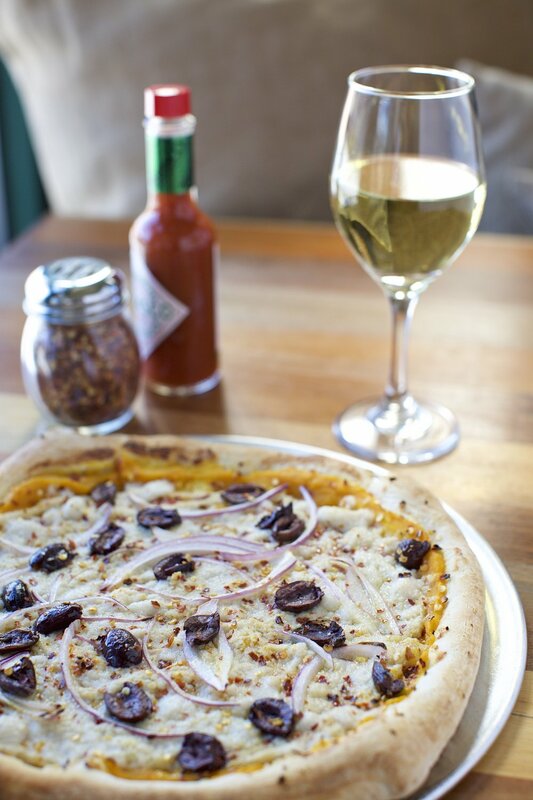 HAPPY HOUR IS EVERYDAY 3:00P - 6:00P | $1 OFF STARTERS, wine, and draft beer. Parmesan. House-made organic San Marzano tomato red sauce. Straight out of Brooklyn. Roasted cherry tomatoes. House-made organic cashew ricotta. Basil. Garlic. EVOO. Organic cashew mozzarella. Italian sausage. * Red onion. Organic kale and walnut pesto. Garlic butter. Parmesan. Organic Kale. Parmesan. House-made croutons. House-made organic cashew-based caesar dressing. Organic spring mix greens. Dried cranberries. Walnuts. House-made balsamic vinaigrette. Organic romaine. Roma tomatoes. Cucumber. Roasted red pepper. Red onion. Black olive. Pepperocini. House-made croutons. House-made organic cashew-based creamy Italian dressing. House-made organic San Marzano tomato red sauce. Organic cashew mozzarella. Basil. House-made kale walnut pesto. Organic cashew mozzarella. Sun-dried tomatoes. Red onions. Artichoke hearts. Sea salt. House-made San Marzano tomato red sauce. Organic cashew mozzarella. House-made organic cashew ricotta. Meat crumble. House-made BBQ sauce. Organic cashew mozzarella. Smoked organic cashew mozzarella. Meat crumble. * Red Onions. White Mushrooms. Garnished with green onions. Extra virgin olive oil brushed crust. Organic cashew mozzarella. House-made organic cashew ricotta. Garlic. Shiitake mushroom bacon. Arugula. House-made San Marzano tomato red sauce. Organic cashew mozzarella. Green bell peppers. White onions. Italian Sausage. * Roma Tomatoes. Roasted lemon-drizzled jalapeños. Created by our own kitchen superstars, Angelica & Gregorio, from Mexico! EVOO brushed crust. Organic cashew mozzarella. Parmesan. Rosemary. Truffle. 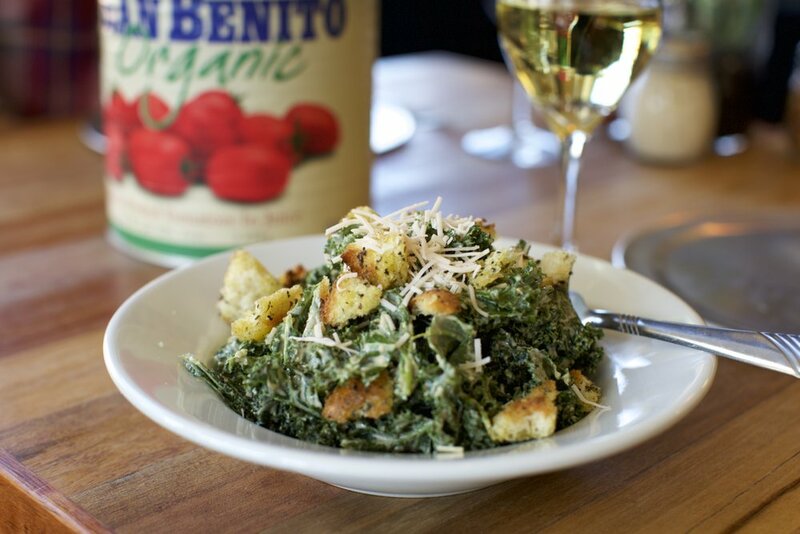 Please ask your server for chef's choice of seasonal, local, mostly non-gmo and organic veggies. EVOO brushed crust. Garlic, buffalo sauce, and organic cashew mozzarella. Red onion. Fire-roasted buffalo cauliflower. 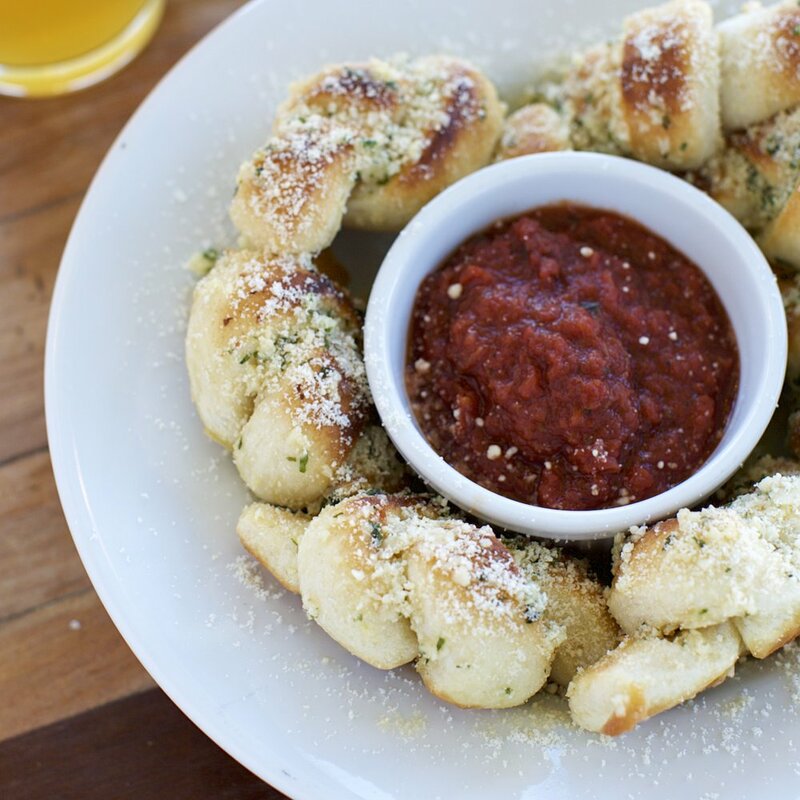 House-made ranch. Green onion. House-made San Marzano tomato red sauce. Organic cashew mozzarella. Meat crumble. Roma tomatoes. Red onions. Sun-dried tomatoes. Black olives. Basil. House-made San Marzano tomato red sauce. Organic cashew mozzarella. Extra virgin olive oil brushed crust. Roma tomatoes. Organic cashew mozzarella. Garlic. Basil. Creamy Italian. Balsamic Vinaigrette. Pesto. Caesar. Buffalo. BBQ. Vanilla icing. Ranch. Pepperoni. Meat crumble. Italian sausage. Shiitake mushroom bacon. Roma tomatoes. Sun-dried tomatoes. White mushrooms. Shiitake mushrooms. White onions. Red onions. Green onions. Black olives. Kalamata olives. Roasted red peppers. Green bell peppers. Artichoke hearts. Arugula. Basil. Garlic. Jalapeños. Pineapple. Broccoli. Kalamata olives. Pepperoni. Lemon-roasted jalapeños. Buffalo cauliflower. Organic cashew mozzarella. Organic smoked organic cashew mozzarella. House-made cashew ricotta. Please ask your server for seasonal flavors. Our signature knots of double zero dough, covered in a cinnamon brown sugar,* and topped with our housemade vanilla icing. Mexican Coke. IBC Cream Soda. Craft Spicy Ginger Beer. IBC Root Beer. Izzy Sparkling Juice. Lagunitas IPA. Upslope Craft Lager. Rotating Draft. Dale’s Pale Ale. Slope Style Red IPA. Dayblazer Golden Ale. Big B's Harvest Apple Cider. Death by Coconut Irish Porter. Epic Day Double IPA. Wild Cider. Crank Yanker IPA. Favorite Blonde Ale. Black Eddy Black IPA. New Belgium Pilsner. Fat Tire Amber Ale. Pick Axe IPA. Accumulation IPA. Maple Nut Brown Ale. Colorado Native Winterfest. If you would like to place a to-go order or check hours, call us at (970) 423-6693! TAlk to you soon! Thank you for your note! We will be in touch soon! 520 S Main St, 3m. Remember, Piante is closed May 6 - 22 2019! ©2019 Piante Pizzeria. All Rights Reserved. Photography by Wheeler & Williams Photography.